Cornish Connection Barbershop Chorus always welcomes new members. 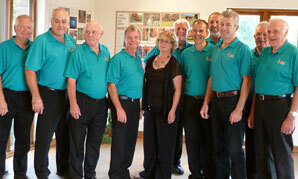 Read about some of the current members and why they love singing Barbershop. Terry Wagstaff – Bass – has sung in many MVC’s but enjoys barbershop more. His favourite song is ‘Aura Lee’ and ‘Love Me Tender’ which we sung at his wedding. Richard Higman – Lead, Baritone and Bass – has led the chorus rehearsals as temporary MD. He likes ballads and up tempo tunes and 4 part harmony singing. Likes to get to grips with new songs and teach them to others. 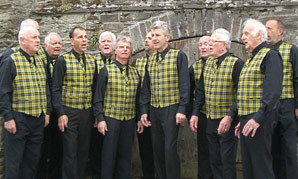 Bill Broadley – Baritone – made the transition from male voice choir to barbershop as he prefers the close harmony style and camaraderie of the chorus. Bill’s favourite song is ‘Goodnight Sweetheart’. From time to time we hold 6 week ‘Learn to sing barbershop’ courses. These are usually free and an ideal way of experiencing the fun of singing together in a friendly environment. Keep an eye on our News page for updates on courses. Alternatively to sample some of our songs you can visit our Songs page. If you’d like to join, visit the Contact page to drop us a line.